New homes with 5,000 square feet or more of living space posted a small increase in market share last year, according to the Census Bureau’s Survey of Construction. In 2014, the share of new homes this size reached a post-recession peak of 3.75% of new homes started. The total number of 5,000+ square-foot homes started that year was 24,000 units. 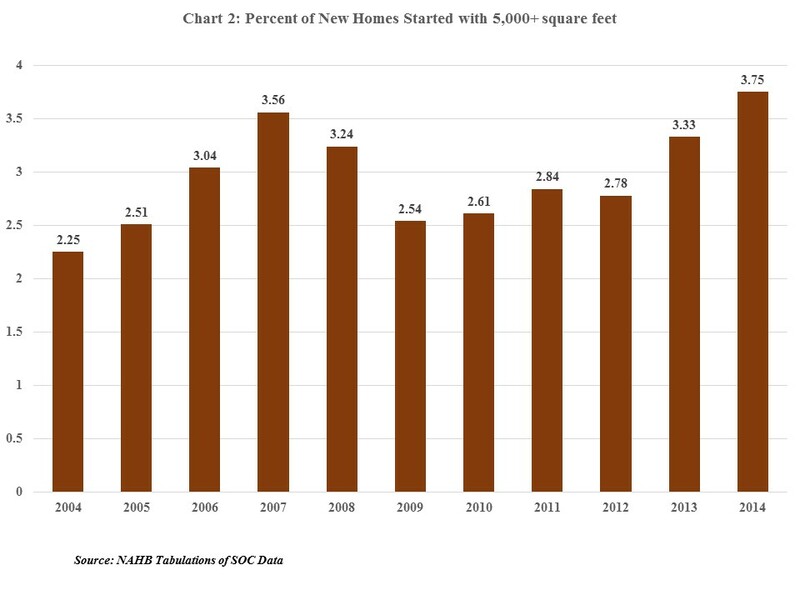 In the boom year of 2006, 3.04% or 45,000 new homes started were 5,000 square feet or larger. In 2007, the share of new homes this size was 3.56%, yet the total number of 5,000+ square-foot homes started that year fell to 37,000. In 2008, only 20,000 such homes were started or 3.24% of the total. From 2009 to 2011, fewer than 13,000 of these large homes were started every year, accounting for less than 3% of all new construction during this period. Previous posts have discussed the upward trend in the median and average size of new single-family homes and how part of this is likely due to a historically atypical mix of buyers in the market. In 2012, the number of new homes started with 5,000+ square feet rose to 15,000 units, yet their share remained at only 2.78%. In 2014, while the number of 5,000+ square feet homes started (24,000) was the highest since 2008, their share of the new market (3.75%) was the highest since 2004. 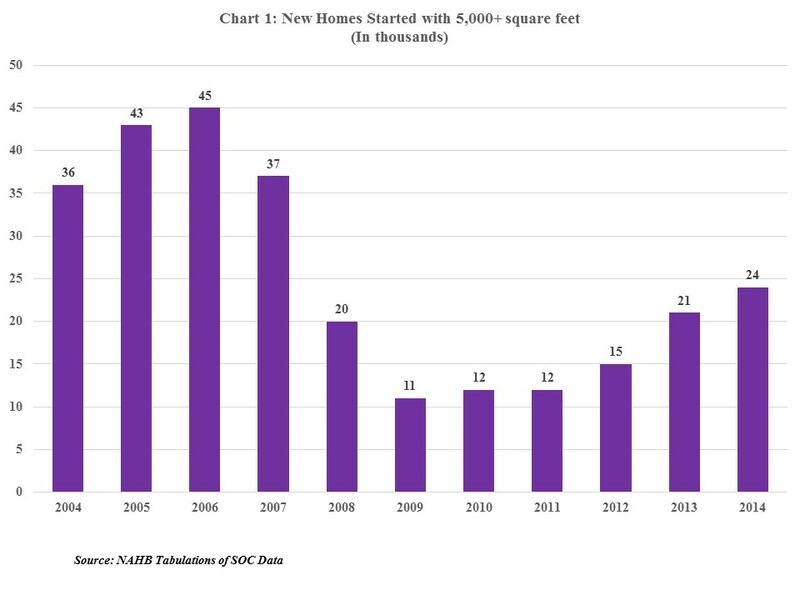 The extent to which the 5,000+ square foot homes have recovered roughly to where they were in 2008, both as a share of all new construction and in absolute numbers, shows a growing trend at the top of the market.